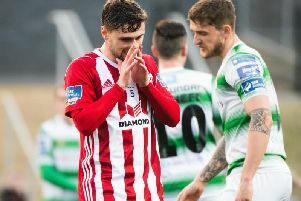 KEVIN DEERY heaped praise on Derry City players for responding to the management's half-time team-talk which inspired a crucial victory over Sligo Rovers. The Candy Stripes' assistant manager was delighted as the Brandywell club clawed out a first win in four games courtesy of clinical second half goals from David Parkhouse and Ciaron Harkin. And Deery was especially impressed with how the players reacted to their 'pep-talk' at the interval following a sluggish opening 45 minutes. "We had to correct a few things second half," explained Deery. "We felt we didn't really play well enough on the front foot enough in the first half. "We let Sligo control possession in their own half and couldn't get our pressing game properly and we changed a few things in the second. "So it's testament to the players for carrying out those instructions. A lot of credit goes down to our desire not to give up on the possibility of winning three points. We showed our fitness and our desire to get to grips with the game in the second half and it was two fantastic finishes." Ciaron Harkin celebrates scoring Derry City's second goal against Sligo Rovers. The victory - a third in seven league games - leaves the Foylesiders in fourth place, three points behind third placed, Bohemians. While Deery isn't overly concerned about the league standings at this early stage, the Creggan man believes it was important not to allow Sligo to leapfrog them. "It's a massive three points for us in terms of moving forward and where we want to get to this season. We lost here a fortnight ago and it's a long two weeks after losing a game, It doesn't matter who its against. People say we were expected to lose against Dundalk but as players and staff we were really disappointed but we moved on tonight. Everything was about the three points tonight. "Things are moving forward," he insisted, "We're fourth at the minute and it's early in the season but we're delighted to get the three points. Derry City assistant boss, Kevin Deery was delighted with the response from his players. "You don't want a team coming here who can climb above you because it can really knock you so we're delighted we can put a gap between ourselves and Sligo and keep and eye on the teams above us." With Peter Cherrie missing out through a troublesome hand injury, it offered an opportunity for Nathan Gartside to make his first start for the club and he didn't disappoint, producing a world class save to deny Liam Kerrigan in the first half. Deery hopes the performance and clean sheet will give the ex-Watford keeper confidence. "A special mention to Nathan Gartside who made a tremendous save in the first half to keep the score at 0-0 going in at half-time.," added Deery. "That was his senior debut so I'm delighted for him and hopefully he kicks on now because we need competition all around the pitch. and it's no different in nets." Goalscorer, Parkhouse also received the plaudits as he netted the all important opening goal just short of the hour mark to follow on from his superb striker for the Northern Ireland U21s against Mexico midweek. And Deery felt his recent performances warranted a goal. "We're absolutely delighted for David. Sometimes he's very unselfish for the team and does a lot of work. He never stops and deserves goals. His commitment and willingness to run and work and stop the centre backs from having an easy night, It's everything you want in a player and we're delighted he got a goal tonight. You can see how much it means to him. He's been brilliant and really infectious around the club as they all have so we're delighted with everything at the minute." Derry waited two weeks for a game due to the international break but now the fixtures come thick and fast, starting with the EA Sports Cup second round clash with Longford Town on Tuesday night at Brandywell and Deery has already turned his focus to the visit of the Midlanders. "It's on to the next game which is our mentality at the minute. Let's bring it on and enjoy it."